Hello Friends, are you looking for Bombay High Court Recruitment 2019? If yes then, here is a good opportunity for you. Bombay High Court has published an advertisement for 199 Senior System Officer Post. Interested candidates can apply for Bombay High Court SSO Vacancy through online mode. Participants must fill online application form from 12.02.2019. Online registrations for Bombay HC Jobs will close on 26.02.2019. For more details relevant to eligibility criteria & selection process you can read the given article carefully. 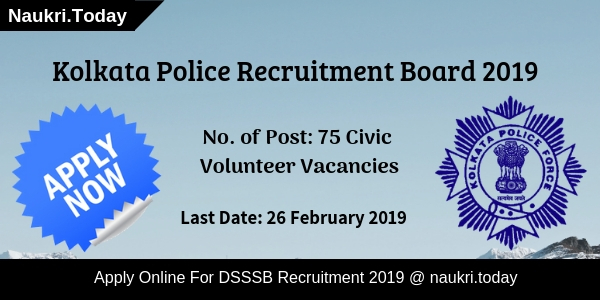 Fresh Update as on 26.02.2019: Participants who have not applied yet for SSO Post must fill application form for Bombay High Court Recruitment 2019. Applicants should not delay now. Online registrations is going to close now. Applicants can check eligibility criteria & selection process from here. 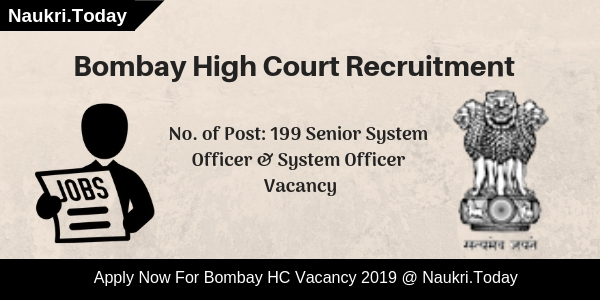 What Will Be Tenure For Appointment Of System Officer In Bombay High Court SSO Vacancy 2019? In Which Circumstances Participant Can Be Disqualified For Appointment In Bombay HC Recruitment 2019? Which Documents Have to Carry At The Time Of Interview For Bombay High Court Recruitment 2019? What is the Important Dates For Filling Bombay High Court PA Online form, Division of Bombay HC Jobs ? How I Check Required Qualification for Bombay High Court Recruitment 2018 ? AM I Eligible for Bombay HC Personal Assistant Jobs 2018 ? What is the Selection Criteria Fro High Court Bombay PA Vacancy 2018, Exam Pattern for Personal Assistant Jobs ? How I Fill online Form For Bombay High Court Recruitment 2018 ? Must have degree of B.Tech & B.E. in Computer Science. Required experience from any recognized university. Age Criteria Candidate should not have age more than 40 years as on 12.02.2019. Selection Process For Bombay High Court Jobs Participants will be selected on the basis of interview for Bombay High Court Recruitment. For System Officer Post, there will be tenure of one year but it can be extended up to five years. This is because appointment of System Officer post will be on Contract Basis. Applicants can be disqualify from appointment of BHC SSO Jobs because of the reason given below. If candidate have more than two children. Participant directly or indirectly influences “Selection Committee” in any manner. If aspirant have more than one wife. Applicant is not a citizen of India. All documents must be duly attested. Conclusion: Bombay High Court is inviting applications for 199 Senior System Officer & System Officer Vacancies. Eligible & Interested candidates can apply online for Bombay High Court Recruitment 2019. Participants should submit their online forms for Bombay HC Vacancy till 26.02.2019. Dear Applicants, High Court of Judicature At Bombay has released recruitment notification of 99 Personal Assistant Vacancy in Bombay, Nagpur & Aurangabad High Court. If you are interested in PA Jobs in high Court then fill the application form for Bombay High Court Recruitment 2018 from here. Mode of Submission of Application form is Online Mode. Last Date for submitting Bombay High Court Jobs Online form is 25.09.2018. Bombay High Court has released an advertisement of 99 PA Vacancy. Those applicants who are waiting for Bombay High Court Vacancy can fill the online form here on or before the closing date. Before applying online form, candidates should read about “What is the required Qualification for High Court Bombay Vacancy ?” from here. Other information about Bombay HC Recruitment you can check from below section. Minimum age of the candidates for Bombay High Court Recruitment should be 21 years & Maximum age for PA Jobs must be 38 years as on last date of registration. Age relaxation for Bombay HC Recruitment is applicable for SC/ST/OBC category up to 05 years. Applicants should pay Rs. 300/- as application fee applying for Bombay high Court job Online form. applicants can submit application through any Online or offline Challan Mode. Candidates who will get selected for Bombay High Court Personal assistant vacancy, will paid pay band Rs. 15,600/-t o39,100/- with grade pay Rs. 5,400/-. Selection Criteria For Bombay high Court PA Recruitment 2018 : Final Selection of the candidates for Bombay High Court Recruitment 2018 will be based on the Given exam Scheme. Merit list of selected candidates will display on official website after examination. you can check more details about Examination & Other from here. Keep visit here for more updates about High Court Bombay Recruitment 2018. (a). English Shorthand Test : Dictation of two passages in English containing total 600 words for transcription as Ascertain the speed in Shorthand. The exam will be of total 40 marks. (b). Typing Test : A passage in English containing 500 words for typing to ascertain the speed in typing. Typing test will consist of 40 marks. (c). Viva Vice : Viva Voce must be of total 20 Marks. Final merit list of candidates will be based on Marks obtained in All examination out of 100 marks. Other information you can get from Bombay high Court Jobs Notification. First of all visit to the official website www.bombayhighcourt.nic.in. Now click on Recruitment Section & read out Bombay HC Vacancy notification. Fill al required information in form properly. Now deposit application fee through any online or offline mode. Click on submit application form. Conclusion: Bombay High Court Recruitment 2018 for 99 Personal Assistant Jobs. candidates can fill online form for Bombay HC vacancy on or before the last date, that is 25.09.2018. Are you waiting for Bombay High Court Recruitment 2018?? If yes, then here is good news for you. High Court of Bombay has released notification for filling up 54 Clerk Vacancy. Applicants those are interested and eligible may apply through online mode either here or official site. The application form of BHC Clerk Vacancy is available from 10.09.2018. Applicants can fill their online form till the last date 19.09.2018. Candidates those are searching govt. jobs may apply for Bombay High Court Jobs 2018. Furthermore, information check below article carefully. High Court of Bombay is inviting online application form for filling up 54 Clerk Vacancy. This is a golden a golden opportunity for candidates those are looking Bombay High Court Vacancy 2018. They can fill their online application from 10.09.2018. Rest information such as eligibility criteria, application fees, selection procedure and how to apply is mention below. Please read our full article properly and apply online for BHC Recruitment 2018. Candidates who want to fill Bombay High Court Online Form 2018 must fulfill eligibility criteria also. They must check given below education qualification, age limit details to ensure that they are eligible or not. Applicants should be Graduate in any stream from recognized university. Preference will be given for those candidates who hold a Degree in law. Furthermore, information regarding qualification check Bombay High Court Vacancy 2018 Notification. Candidates who want to apply for Bombay High Court Clerk Recruitment 2018 should complete 18 years. The maximum age is required 38 years. Upper age relaxation is applicable as per govt. norms for BHC Clerk Jobs 2018. SC/ST/OBC candidates will get 05 years maximum age relaxation. Participants will get select on the basis of Written examination, Screening test and viva-voce. First candidates have to qualify the written examination. The written examination contains 90 marks and the duration of examination will be 01 hours. To qualify Bombay High Court Clerk Jobs 2018 exam applicants must collect minimum 45 marks in written examination. After that, English Typing Test organize which contains 20 marks and the duration is 10 minutes. To qualify typing test of BHC Clerk Recruitment applicants must type 40 words per minute. Then candidates will call for viva voce process. Furthermore, information check High Court of Bombay Recruitment 2018 Notification. For Bombay High Court Recruitment 2018 candidates have to pay Rs. 300/- through “SBI Collect”. The fees once paid is not refundable. Those candidates selected for High Court of Bombay Clerk Recruitment, they will also receive an attractive salary. Participants will get Rs. 5200/- to Rs. 20200/- with Grade Pay Rs. 1900/- & other allowances as per rules. Interested and eligible candidates can fill their online application form either here or official site. The direct official link to apply online for BHC Jobs 2018 is also mention on below segment. So if you are going to fill application form must have valid email id, mobile no. and scan copy of photograph & signature. Now follow some given below instructions to apply for Bombay High Court Vacancy 2018. First of all, go to the official site bhc.gov.in. Download BHC Clerk Job Notification 2018. Now go to apply online for Bombay High Court Vacancy 2018. Enter your personal details and educational information. Click on I Agree button. Then your registration process is finished. Make Payment of application fees through SBI Collect. Download Bombay High Court Recruitment application form. You can directly apply online for High Court Of Bombay Vacancy through below link. Conclusion: High Court of Bombay Notification 2018 for employment of 54 clerk vacancy. Applicants those are desired and deserving for Bombay High Court Recruitment 2018 for Clerk Post may apply through online mode only. The online application form is available from 10.09.2018 to 19.09.2018. Dear Applicants, Bombay High Court Recruitment 2018 is available for 8921 Vacancy for the Post of Junior Clerk, Stenographer and Peon/Hamal. Bombay High Court has published Notification on 28.03.2018 for BHC Junior Clerk Jobs 2018. Applicants those who are interested in Government Jobs must apply for Bombay High Court Vacancy 2018. Candidates may download BHC Recruitment 2018 PDF from Links Given below or from official Website. Aspirants can fill up their Application Form from 28.03.2018. Candidates who do not found eligible for BHC Vacancy 2018 their forms will be rejected. Aspirants must apply before last date 10.04.2018 for Bombay High Court Recruitment 2018. Participants must check Eligibility Criteria which is given below. Here we provided you brief detail about Bombay High Court Jobs 2018(check below). Participants can apply with the help of links available here. Candidates must download BHC Junior Clerk Recruitment 2018 Notification Pdf from links given below. Applicants may also check selection Process before start preparing for BHC Junior Clerk Jobs 2018. Participants can apply on suitable Posts for Them. Here we Provided you List which shows Post wise division of Vacancies for Bombay High Court Junior Clerk Vacancy 2018. Applicants may also download BHC junior Clerk Notification 2018 Pdf with the help of links given below. Participants must check eligibility Criteria before applying for BHC Jobs 2018. Candidates who do not found eligible their form will be rejected. Here we provided you information about Education, Age Limit and Pay Scale for BHC Group 4 Vacancy 2018. Applicants those who are going to apply for BHC Vacancy 2018 for Junior Clerk and Stenographer Post must passed S.S.C. 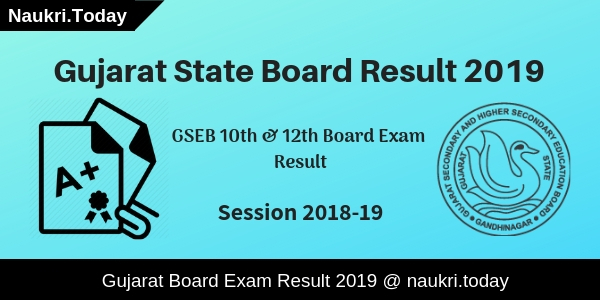 Board Examination from any recognized University of Government. Candidates who applied for Junior Clerk and Stenographer Post should have excellent Typing Speed such as 40 w.p.m for English Language and 30 w.p.m for Marathi Language. Aspirants who applied for Peon/Hamal Post need to Passed 7th Standard with a good Physique. For Furthermore details Applicants should check Bombay High Court Recruitment 2018 at official Website or From Links provided here. Participants who have good computer Knowledge must apply for Bombay High Court Group 4 Jobs 2018. Minimum Age required for Bombay High Court Recruitment 2018 is 18 years and Maximum Age required is 38 years. 5 years of Age Relaxation are given to Schedule Caste, Schedule Tribe and Other Backward classes Candidates. Participants must download BHC Notification 2018 from Links given below. Applicants may also consult all details to Official Notification of Bombay High Court Group 4 vacancy 2018. Here we provided you details related to Salary Package for BHC Recruitment 2018. Bombay High Court Set a good Amount of Pay scale for Applying Candidates. Participants must check Official Website of Bombay High Court Recruitment 2018. Participants should be face two stages : Written Test and Interview. Candidates who applied for Junior Clerk and stenographer Post they should first attempt Typing Test. BHC Vacancy 2018 will conduct Typing test in both Language English and Marathi. Applicants who applied for BHC junior clerk Jobs 2018 will type 300 word in 10 Minutes. For Further more details Applicants must read official Notification Carefully. Applicants can apply from Links Provided here for Bombay High Court Vacancy 2018. There is no Application Fee for any Candidates who applied for Bombay High Court Junior Clerk Recruitment 2018. For More details candidates must consult Official Notification of Bombay High Court Jobs 2018. Here we provided you easy steps which help Candidates to Fill up Application form. Interested and eligible candidates may apply through online mode. Before apply all applicants advised they must have valid mobile no., email id. Applicants also have scan copy of require documents for Junior Clerk, Stenographer and Peon/ Hamal Jobs. In below section, Here we provided you some instruction to apply for Bombay High Court Recruitment. Firstly, Applicants must log on to BHC Jobs 2018 Official Website i.e. bhc.gov.in. Secondly, Candidates must search for recruitment section at home page. After that open Advt of Bombay High Court Notification 2018. Then read all details carefully and check Eligibility Criteria. Eligible Applicants must fill up Application form. Candidates must recheck all the details carefully. Now applicants should submit their application Form. Candidates must note down Password and Registration Number. Conclusion : Bombay High Court has published notification for 8921 Vacancy for the Post of Junior Clerk, Stenographer and Peon/Hamal. Interested candidates can apply from 28.03.2018 for Bombay High court Recruitment 2018. Candidates may Apply up to 10.04.2018 for BHC Group 4 Recruitment 2018. Applicants must check eligibility criteria, Age Limit and much more.